Willy Russell's tale of twin brothers brought up in different families but becoming friends without knowing the nature of their relationship, is a believable and straight-forward one with no unneccessary complications or contrivances. The performances of Jacqueline Hannan as Mrs Johnston and Sarah Halliwell as Mrs Lyons were both impressive but it was the four younger central cast members that really blew me away tonight. Neil Thomas as Mickey gave an emotionally raw performance and did a great job of showing the transformation from carefree wild child to angry and frustrated young man. As Edward, Darren Martin made a suitably sheltered child, wide-eyed on his first glimpses of the 'real world' and then later as the adult Edward a sense of bewilderment at his loss of Mickey's friendship. Katie Milne brought a real level of angst to her role as the adult Linda and a sense of fun to her younger self. These three managed to generate a real and authentic level of chemistry to their relationships. Acting as our on-stage narrator Christopher Hunter maintained his level of visible distress throughout - despite the sometimes hilarious antics taking place in front of him, and was excellent when interacting with the mothers. The whole cast was clearly throughly committed to their roles and prepared to suffer for them. There are no sound effects or pulled punches here - these guys really delivered quite savage violence with Edward receiving a serious beating from his mother and Linda delivering a slap to Mickey with such force that the audience gasped. I'm not entirely sure I can advocate this technique but it was certainly effective. Those of you who read my reviews regulalry will know that I'm an absolute sucker for stylish/clever direction and Sam Boyd's had this in abundance. A nice portrayal of the factory production line, a visually stunning freeze-frame ending, and a wonderful segment of several short silent scenes showing time passing. I loved this from start to finish and it has some of the best dramatic performances I've seen at the Fringe this year, but I do need to add a couple of caveats about the venue. There was some confusion/problem with ticketing and seats being oversold and I hope the venue/box office can ensure this is prevented in future. The room is far from ideal - the lack of any form of tiering must make viewing the performances difficult from a few rows back and the air con machine may pump cold air towards the stage but it forces warm air into the audience! But these are minor quibbles and if the cast are happy to suffer beatings and bruises I'm not really in a position to complain about such trivialities. 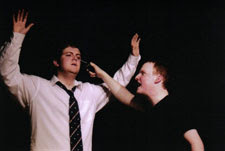 "Blood Brothers" runs on the 16th, 17th & 18th at 20:15 but tickets are limited. Please note - the venue was Understairs @ Euroscot and has now been renamed as Seven Dwarves at Euroscot.